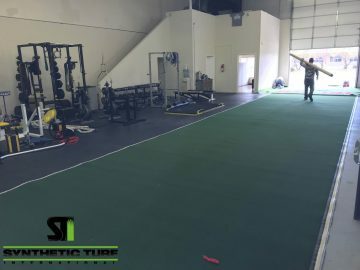 Recently Synthetic Turf International dealer Turf Specialties LLC located in Albuquerque, New Mexico installed synthetic turf in TNT Gym. 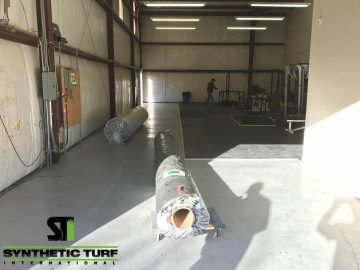 Turf Specialties LLC is an extremely valued member of the Synthetic Turf International (STI) family, and they have an incredibly active social media presence and love to install our products. If you visit their Facebook page, you will see Marcus Molina in front of the camera giving an update on the install of the turf and the gym where it is installed. 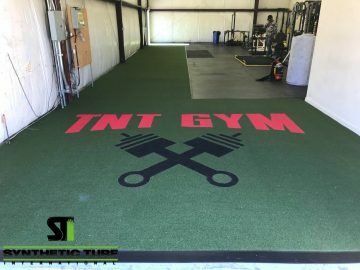 TNT Gym chose to install approximately 1,000 square feet of STI’s Trainer’s Choice with an AquaFab cut of the TNT Gym logo. They installed transitions along all of the major traffic areas to provide a more stable surface and ensure that the turf will look good for years to come. Trainer’s Choice is an exceptional product for indoor and agility applications. This non-rubber infilled turf has all the advantages of previous generations and performs even higher in wear and resistance tests. The blend of nylon and polyethylene is an almost perfect 50/50 combination. This gives you the true ball roll of a traditional nylon field, with the softness of the new generation rubber-filled turf. No rubber infill makes maintenance easier, and up to 10% cooler. These systems can also be portable with added 4” or 8” Velcro. Visit our application page for more information, browse our gallery for ideas and contact Synthetic Turf International to Experience A Greener World and a maintenance free lawn and landscape.